In April 2002, McCaskill married St. Louis businessman Joseph Shepard. Shepard lent $1.6 million to McCaskill's 2004 gubernatorial campaign and also had business interests in the nursing home industry. Because as state auditor McCaskill was responsible for auditing the Missouri Department of Health and Senior Services, which regulates the state's nursing home system, Shepard's financial interests in the industry became an issue during the 2004 gubernatorial campaign. 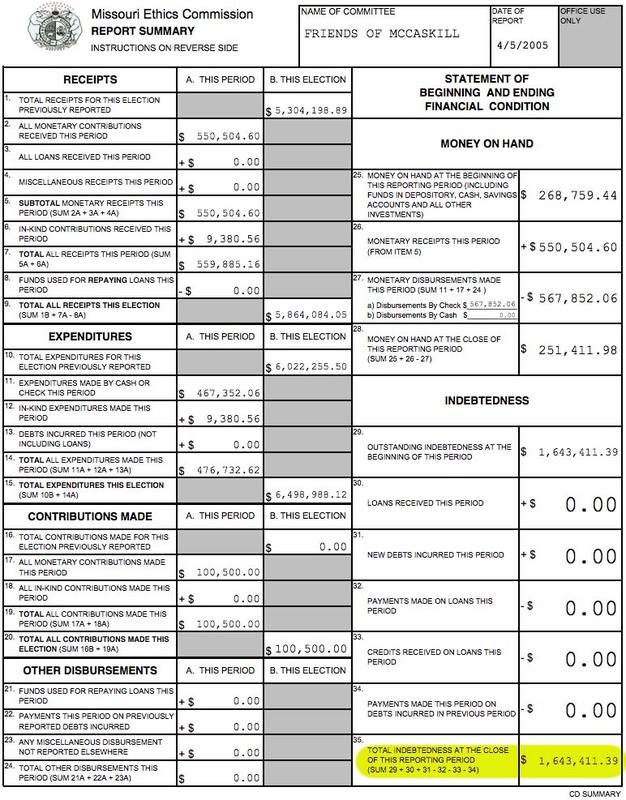 McCaskill's 2005 campaign finance report shows the astounding debt she amassed in her failed 2004 gubernatorial campaign: $1,643,411.39. The relevant page from that report is below. 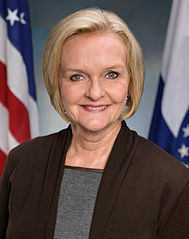 Five FEC commissioners – three Democrats and two Republicans – will consider this week whether to make McCaskill eligible for a narrow exemption from federal laws that will allow her to solicit unlimited contributions under a recently passed state law. Since 2004, McCaskill has been creatively keeping from having to pay the debt by moving it from her gubernatorial committee to her state auditor committee and then restructuring the auditor committee to again avoid paying the loan. Not surprisingly, McCaskill’s campaign did not call the Post-Dispatch to comment on the preliminary FEC ruling that commissioners will consider on Thursday. 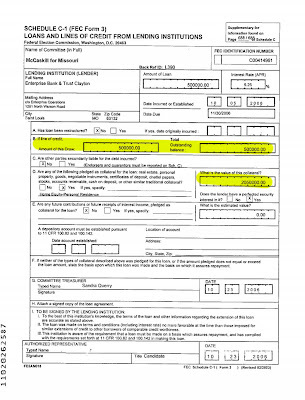 During her 2006 campaign for US Senator, McCaskill took out another loan. 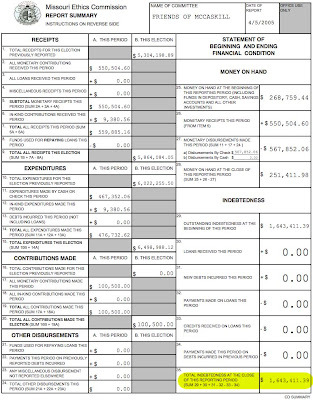 She appears to have secured this half million dollar loan with the $2 million dollar house she shares with her husband based on her FEC filings (see embedded image). 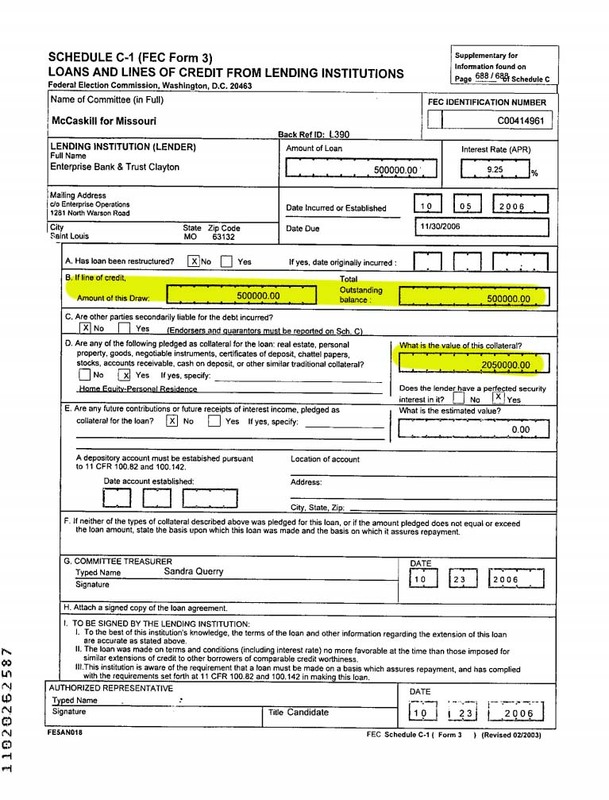 McCaskill sat on the 2004 loan of $1.6 million she got from her husband. 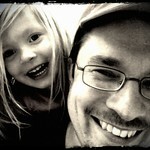 Then, in October of 2006, she secured another $500,000 loan with their house. She borrowed over $2,000,000 which she didn't pay back until 2007 to (eventually) get elected to Congress and then leaned on donors to pay off these obligations, most of which were to Shepard, her husband. Shepard's reward appears to have been the foie gras and filet with friends in the US Senate Dining Room.